Today we entered our last week of class and we started it off right! Located on 4th Street a block south from the Promenade Cinema is a place called Indigo Palette. It is mainly known for being an art gallery, but offers a coffee shop and dining area as well. The weather was beautiful at 11:00 this morning, so the sun shining through the front windows brightened the dining area in the rear of the building. Artwork covered every inch of the walls and it was all very impressive. Immediately after being seated, two friendly waitresses came over to take our drink order. Because this was also a coffee shop, I ordered a specialty coffee drink that had white chocolate and caramel in it, both of which are ingredients I love. I looked over the menu to decide what I wanted to eat, but this time I was only looking for a hamburger to eat because it is National Hamburger Day. Wouldn’t you know, the Indigo Palette has a specialty burger called, “The Indigo Burger.” This burger is ½ pound of meat stuffed with your choice of cheeses. I chose the pepper jack and sharp cheddar cheeses for my burger and the balsamic vinaigrette salad for my side. The menu warns that the burger will take 15-20 minutes, and it did take awhile since we also had a larger number of people, but the waitresses handled it well and we were understandable. First, the salad came out and the dressing tasted just as I hoped it would. It didn’t take long after finishing the salad for the burger to arrive and the presentation of it was great. 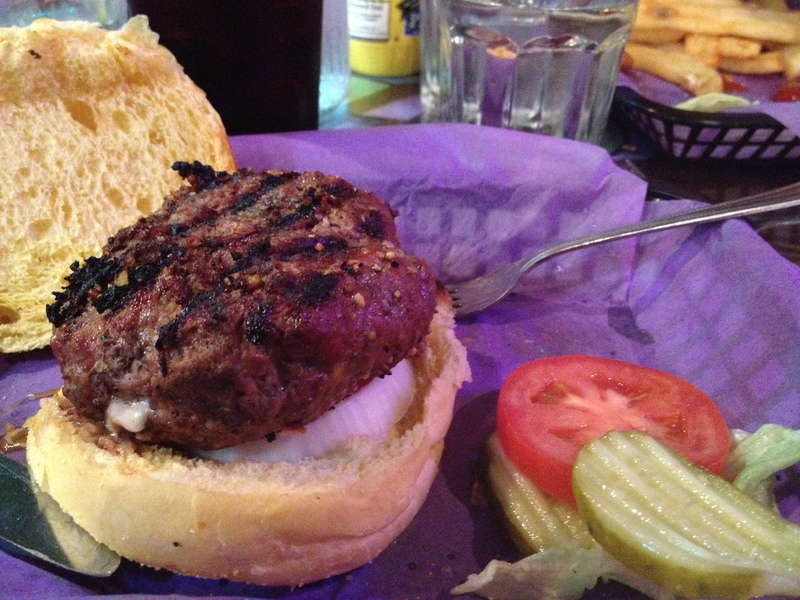 The vegetables were placed on the side and the bun was taken off exposing the huge, cheese stuffed burger. I finally putting the toppings on it, I took as big of a bite as I could and I was in love. The burger was perfectly cooked and the cheese on the inside made it even better. The pepper jack cheese added a kick to the burger and I was very pleased. 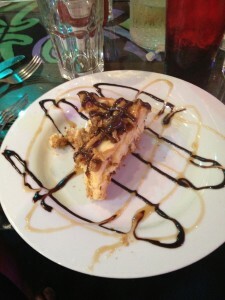 Even after eating the monstrous burger, I saved room for the turtle cheesecake. The presentation was fantastic the way the caramel and chocolate was drizzled over the top. Every bite of it went so smooth down my throat. I managed to finish it all and that filled my stomach completely. I am glad I got the chance to eat at the Indigo Palette. From the moment I walked in to the moment I walked out, I was happy and enjoying my experience. The atmosphere provided art for me to look at while I waited for my food and that sped up the process of waiting. The waitresses were friendly to us and worked hard to keep up with our orders. The menu provided numerous options that I would like and the prices were affordable. I couldn’t possibly have any complaints with the food because I couldn’t even put it down until it was all gone. It would be a fun time to visit this place again with some live entertainment.